Monique Meloche Gallery has been a staple in the West Loop for 8 years. Recently Monique announced that the gallery would be moving to a secret location. This Saturday they will kick off their new space with a show by Robert Davis and Michael Langlois. The always lovely Whitney Tassie was nice enough to answer a few questions about their new location and what they have planned for their Fall schedule. Could you tell me a little bit about the new location of moniquemeloche Gallery? What made you guys decided to leave the West Loop? Our 5 year lease on Peoria was up in August and we wanted something new. We decided to make a significant leap to a neighborhood not known for art galleries. Our new space is at 2154 West Division. It is deliberately smaller but not tiny. 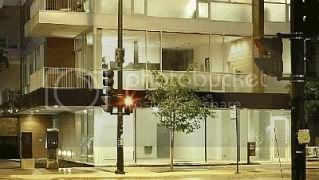 Over the last year or so we’ve been collaborating on a number projects outside the gallery, both in Chicago and internationally, in galleries, museums, and art fairs as well as hotels, unsold condo developments, design showrooms, empty retail spaces, etc. We have adjusted our gallery program to have longer exhibitions, about 5 or 6 a year, and are excited to focus our curatorial energies beyond the gallery as well. What do you and Monique have planned for your Fall schedule? Additionally, we are in the planning stages of organizing a series of site-specific wall projects for the window of our new space. The 1st will be by Carla Arocha and Stephane Schraenen to coincide with the unveiling of their permanent installation “24/7,” a commission by the CTA for the Howard Station. Any Fairs that you guys will be attending? Monique will be attending Frieze this October as Carla Arocha and Stephane Schraenen have a solo show opening at the same time at Vegas Gallery in London. Then we’re headed to NADA in Miami. We’ll be showing three sculptures by Justin Cooper, Rashid Johnson, and Joel Ross. Your opening is on Saturday with Robert Davis and Michael Langlois. Could you tell me a little bit about the show? This is our 3rd solo exhibition of collaborative artists Robert Davis and Michael Langlois. The show consists of 5 graphite portrait drawings. This from the artists “This is our Illuminati, the council of elders, a dinner party wish list serving Beluga and Dom. Like Bill and Ted flying through time collecting greatness in order to save the world we have culled our shepards.” More info is available on our website.